If you've ever had to wait days for the results of a lab test, particularly when you don't feel well, you know how frustrating it can be to get the medical help you need. And it's equally frustrating for medical providers. 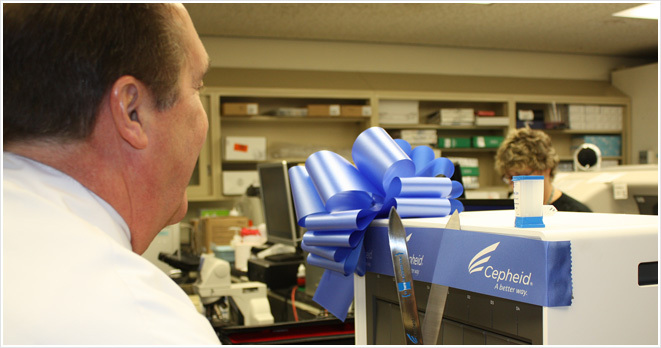 Ohio Valley Hospital has taken steps to reduce or eliminate waiting times for lab test results by offering the new Cepheid GeneXpert System, an advanced laboratory technology. Recently installed, the technology uses the relatively new field of molecular diagnostics to quickly and efficiently deliver test results. According to Manju Nath, M.D., clinical pathologist at Ohio Valley Hospital, the Cepheid GeneXpert System is a cartridge-based nucleic acid amplification test, which is an automated diagnostic test that can identify many microorganisms and also find resistance to antibiotics. "This is a simple-to-use and rapid testing for microorganism and, being a closed system, it has no cross contamination from other specimens," he said. Mark Woods, M.T., A.S.C.P., Ohio Valley Hospital director of laboratory services, said, "The addition of the Cepheid GeneXpert System in our laboratory will enable molecular diagnostic testing of any patient, thereby delivering a better way for the medical providers of Ohio Valley Hospital to identify and treat diseases early." Prior to the availability of the Cepheid GeneXpert System, certain tests needed by Emergency Department patients were sent outside the hospital for processing, with a turn-around time of between three and ten days. With the new technology, tests are performed in-house and results can be available within minutes for some tests. Patients can be treated right away rather than days later. A further advantage of the new technology is the ability to add new tests such as the rapid Flu test with results expected within 30 minutes. Overall, Cepheid offers 22 tests that are approved by the Food and Drug Administration (FDA). Molecular diagnostics is a relatively new field in medical laboratory science, and came about during the late 20th century as DNA sequencing and genomic testing were being developed. The technology combines molecular biology with diagnostic testing in order to detect specific sequences in a patient's DNA which may or may not be associated with disease. According to Mr. Woods, the difference that makes this technology so much faster than conventional laboratory testing is its ability to perform testing in a molecular setting versus the traditional lengthy growth of culture or less sensitive (false negative results) rapid chromatographic immunoassay and/or fluorescence-based lateral flow and membrane-based immunoassays. "This has revolutionized the way we do lab testing for certain diseases," Mr. Woods said. "Patients at Ohio Valley Hospital now have access to a sophisticated technology that will not only improve turn-around times for tests, but will increase opportunities to enhance patient care, survival and quality of life." Dr. Nath said, "This system has helped us to bring the expertise of sophisticated microbiology tests into a community based hospital. Currently, we are using this test for detection of Chlamydia, Neisseria, C-difficle, Factor II, Factor V Leiden and are in the process of bringing flu testing into our laboratory. The test has a high sensitivity (89%) detecting microorganisms and also a specificity (99%) of confirming the type of organism. It also has the capability of bringing multiple other microorganism testing into our laboratory." "This has helped our ER physicians, as well as primary care and infectious disease personnel, with rapid and highly accurate results of detecting infectious organisms, thereby the patients are getting the proper antibiotic therapy on the same day," Dr. Nath noted. The new technology is available not only to patients at the hospital, but also is available to patients in physician offices which can send patient test samples to the hospital for processing. For more information about laboratory testing locations and hours, visit www.ohiovalleyhospital.org.